Hercules, the great demigod from ancient myth, is played by none other than the juggernaut, Dwayne Johnson. According to news and interviews, Dwayne packed on a lot of muscle for this role and it clearly shows on the big screen. If you thought he looked big in the most recent Fast and Furious, well, I'd say double that size. 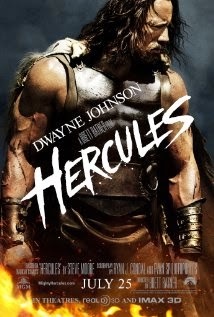 Aside from the guns, Dwayne Johnson did an awesome job as Hercules. The story begins with Hercules working as mercenary for gold and riches. It’s revealed later that he’s suffered a traumatic experience. Hercules' twelve great labors are mentioned throughout the adaptation but only certain ones crucial to the film are shown. He’s followed by a group of trusted friends who have all had tough pasts as well and Hercules has taken them under his wing. They are bonded by battle and never question where they need to travel, nor fight, as long as they are paid. As the story progresses, our hero is hired by a king in need of help. To defeat a tyrant, the king needs Hercules to train his army to be the best of all time. Hercules makes this happen with the help of his company, but in the end, a twist of fate reveals that Hercules helped the wrong person and must fix his mistake. The storyline had its ups and downs, but was still quite entertaining. Leadership, strength, friendship, family and more themes made Hercules an all-around feel good film.